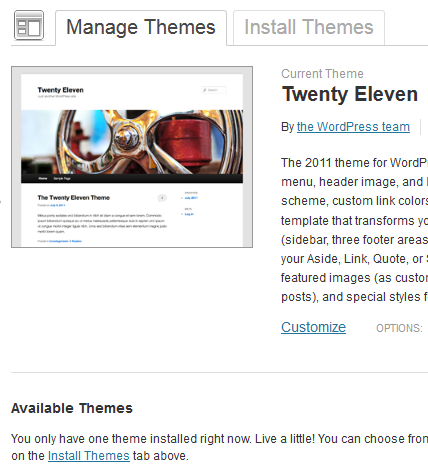 After upgrading to WordPress 3.4, there are no themes show up in section Available Themes on page of Manage Themes in my WordPress Dashboard. And I get no response from WordPress support forum when asking for help. Finally, I figure out how this happens and success to fix it today. In short, if the function of scandir of PHP is disabled on the server, this problem occurs. Because the WP_Theme class introduced in WordPress 3.4 uses this function to detect all the themes available in /wp-content/themes/ folder. You only have one theme installed right now. Live a little! 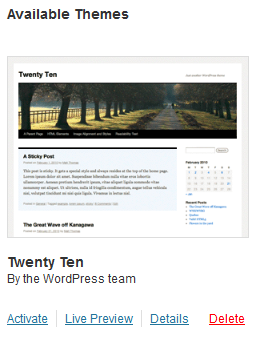 You can choose from over 1,000 free themes in the WordPress.org Theme Directory at any time: just click on the Install Themes tab above. I’m using a VPS from Linode right now. After setuping a LAMP server manually, I optimized the server following some tricks from search results. And there is a trick saying that I should disable some PHP functions to protect the server. So I edited /etc/php.ini file in line of about 386, added some functions to the right of disable_funcions = . scandir is one of these functions.